Jonathan Moss was the referee when Cardiff City played Crewe at Gresty Rd on April 17th, 2006. The game ended 1 - 1. I remember the day as it was my 40th birthday and we went to the game in a limo. 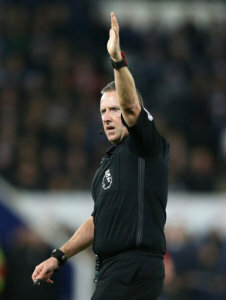 Now some 12 years on Moss is the referee when Cardiff face Chelsea at Stamford Bridge. So far this season he's issued 17 yellow cards in five games. And he's sent two players off as well. Moss was appointed to the Premier League panel in 2011.